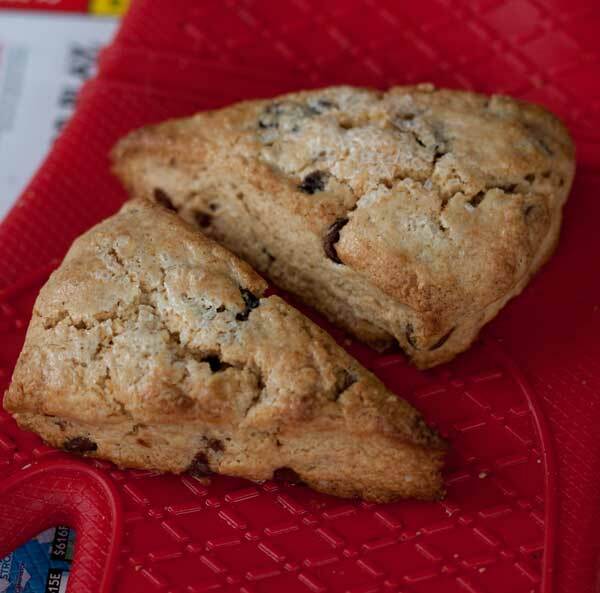 Whole Wheat Chocolate Chip Scones are made with whole wheat pastry flour. The pastry flour helps keep the crumb soft and edges crispy. Preheat oven to 400 degrees F. Line a heavy duty baking sheet with parchment paper. Whisk the flour, sugar, baking powder and salt together in a bowl for about 15 seconds. Add the butter and mix with a pastry blender or your fingers until crumbly. Mix together the cream and vanilla and add to dry ingredients. With a heavy duty scraper, stir to make a somewhat dry dough. Add the chocolate chips and gently knead the dough just until it comes together. Transfer dough to a sheet of parchment or wax paper and shape into a 1 inch thick circle. It should be about 6 inches in diameter. Cut the circle into 6 or 8 wedges and arrange on the parchment lined baking sheet. Brush the wedges with a little extra cream and bake for 20 minutes or until edges are brown. Variations: Throw in a handful of dried cherries and/or pecans. Use frozen blueberries instead of chocolate chips.